visit here we chose to stay at the Porepunkah Bridge Caravan Park ([star][star][star][star]) and it was the best decision we’d ever made. 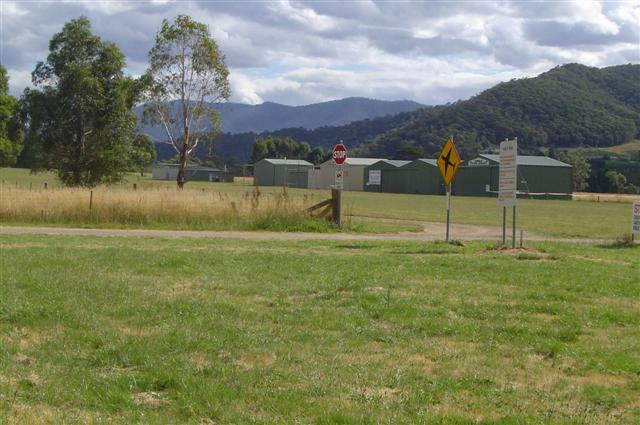 On the banks of the Ovens River, this large, spacious park has a lot to offer. 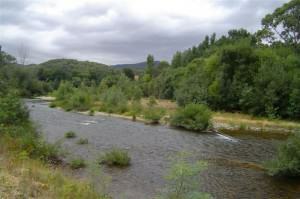 There is a track that runs alongside the river for quite a distance and we were told that there are several excellent fishing spots along here. Our campsite was right on the riverbank and we were to be lulled to sleep each night of our stay by the soft sound of the water flowing over the rocky riverbed. Porepunkah has a population of approximately 450 permanent residents and quite a bit of history dating back to 1824 when the explorers Hume and Hovell first scouted this area. By 1850 significant gold deposits had been discovered in the Buckland Valley and those with dreams of making their fortune flocked to the area. To get to the gold fields, miners had to use Ovens Crossing, the site of modern-day Porepunkah. The township was surveyed in 1860 and from there, as they say, the rest is history. 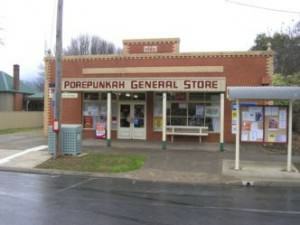 We had travelled down the Great Alpine Road from New South Wales, passing through the towns of Beechworth, the home of Emma George, Olympic gold medal winning pole vaulter, Myrtleford, Ovens, and Eurobin, before finally arriving in Porepunkah. Our riverbank campsite was as close to perfect as it was possible to be. The river is quite shallow at this point and the water is so clear and clean; it flows over the rocks on the riverbed like a “babbling brook”, that’s the only way to describe it. It was extremely peaceful sitting there during the evening, listening to that sound, watching the fish jumping in the water, and just relaxing after a long day in the car. The next morning we headed for Bright, the main town in this particular area and a mere 6 kilometres (3.7 miles) from Porepunkah. What spectacular streets they have in this town! 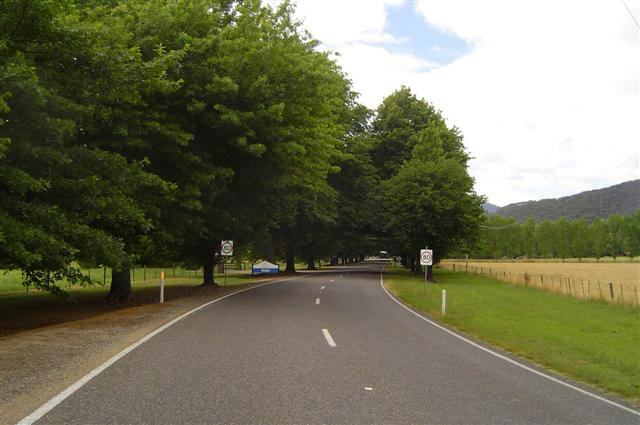 Huge trees, including oaks, elms, poplars, and maples, line each side of the road and the branches are so long and thick with leaves that they form a canopy. In some places it’s almost like driving through a tunnel or an arch. The Great Alpine Road coming into and going out of Bright is bordered in this way and quite a few of the streets in town as well. These trees with their leafy canopies are also abundant throughout the parks; Bright must be stunning in the winter when everything is blanketed in a light dusting of snow! Bright is an area of sub-alpine valleys, surrounding high plains, and pine forests. The first pine forest was planted during the First World War and today forestry is still a significant industry. The wind had died down when we arrived in town so we left our jackets in the car. Big mistake! This is mountain country, after all. I can’t remember the last time I had been so cold in the summer! The main street in town is divided by a median strip with a garden down the centre, the two sides of the road converging at an intersection with a big roundabout. Parking was easy and we left the car for a wander around the shops. We found the local IGA store (there’s one in every town) and bought a few groceries and some fresh fruit and vegetables and then wandered up to the tourist information centre for a few brochures on the area. When I thought that there was a lot to see and do around here I didn’t realise just how much there was. We’ll be lucky to see one-tenth of everything they have to offer. One of the things I really wanted to do was to go for a walk beside the river and later that afternoon we set off to follow the track beside the Ovens River. It’s a well-travelled track but some places were very narrow and one wrong step could have put any one of us in the river. Other places were overgrown with blackberries and brambles so we really had to pay attention to where we were walking. Along the track we passed several people fishing at various points. I don’t know if they were having any luck but it was enough for John to mention that he might get some bait! Oh joy! The banks of the river are literally covered with smooth stones and for a while my boys had a great time skipping rocks across the river. Young son, Sean, is very good at it but John said he needed more practise; he couldn’t quite manage to skip his rocks as far as Sean did. If anyone had asked that day how many children I had I would have said two! I really enjoyed our walk beside the river and didn’t feel like returning to camp too soon but as the sun started to set the mosquitos came out so it was time to go. So, we settled down for the evening with a barbecue, a glass of wine, fish jumping in the river, and the soft calling of the birds in the trees. No traffic sounds, no noisy neighbours. Paradise. The next day dawned to cloudless skies but I wasn’t sure if this was a good thing; it was absolutely freezing! But, then again, we are sleeping in a tent in the mountains. And as the sun climbed higher, we thawed out; it would be a beautiful day. Slowly, the campground was coming to life for another day; children, some still in pyjamas, rode their bicycles along the road at the back of our tent, the smell of bacon and eggs cooking wafted on the breeze, and the “plop” of the odd sinker hitting the water as a line was thrown in sounded softly in the early morn. But Mt Buffalo beckoned and we set off just after 10:00. We entered the Mt Buffalo National Park only a few minutes after leaving camp and climbed upward on a narrow and winding road, stopping briefly at Eurobin Falls. 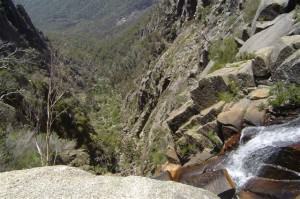 The icy, clear water flowed over huge smooth rocks, went under the road, and crashed onwards towards the Ovens River. 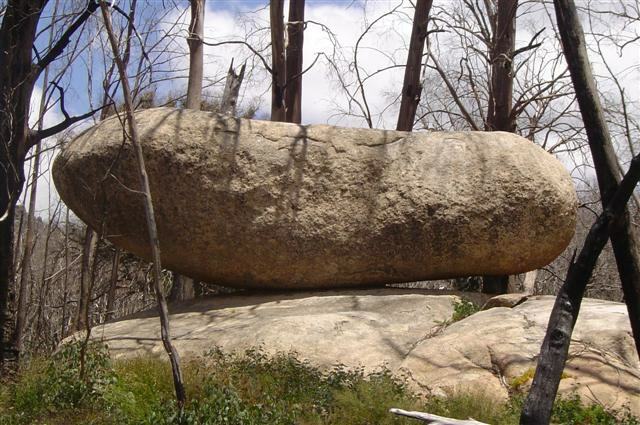 Mt Buffalo, one of Australia’s oldest national parks, was proclaimed a national park in 1898 and is renowned for its magnificent granite tors and spectacular views. We continued our climb to the top and our next stop was the Mt Buffalo Chalet where we discovered that one does not jump out of the car without so much as a sweater at that altitude; the wind was bitter but the views were outstanding! We walked around the Chalet, through the landscaped gardens and around the back to the swimming pool. Yes, swimming pool! Even looking at it made me shiver. The gardens were beautiful; how do those plants survive up here in the extreme winter conditions of snow and ice? The Chalet was opened in 1910 and it still has its old world charm and top of the world appeal. Through the window we could see the interior still decorated in the style of the era although I believe that it has been modernised in all areas. Still, it must be like taking a step back in time. 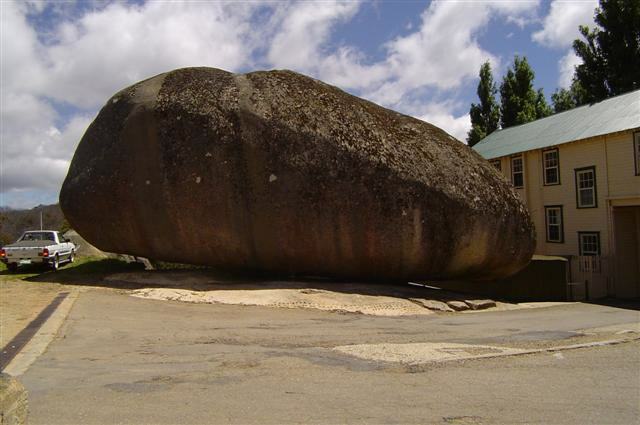 On the other side of the Chalet is an absolutely huge rock, almost butting up against the building. How it came to be there, at the back of the Chalet, I don’t know; what I do know is that it’s a big rock, a very big rock! A car was parked beside it and that gives a good idea of the actual size of it but when John and Sean sat in front of it they were totally dwarfed! There are several walking trails around the Chalet and we went down to the Gorge Heritage Trail, following it along to Crystal Brook Falls. From the viewing platform at the falls you can see the valley far below. There is a small footbridge that passes over the water before it goes over the falls. A photographer had been commissioned over 100 years ago by the Bright Alpine Club to photograph the plateau as part of a fund raising campaign to build a track from the valley below. The footbridge was built in the exact spot where the photograph was taken. The track to Crystal Brook Falls continues further along for another few kilometres but we re-traced our steps and climbed up to Bents Lookout. Mt Buffalo Gorge and the Buckland Valley can be seen from the viewing platform at this lookout. And what a most spectacular view; totally unobstructed and simply amazing. Continuing our upward journey we passed several interesting places but our goal, now, was the summit so we decided to stop at these spots on the way down. At the very top of Mt Buffalo, The Horn at 1723 metres (5653 feet) has another viewing platform but the road ends 3 kilometres (1.8 miles) below it. It was much too windy and cold for me to make the trek up but John and Sean did give it some thought before deciding against it this time. We’d passed several bicycle riders on our way up the mountain and as we began our trek down a few of them were just reaching the top. The road up was steep enough in the car and these people were riding bikes! Just watching them had me out of breath! The road down the mountain had an eerie look to it; all the dead trees above the snow line looked like ghost trees. The Cathedral is a granite tor that rises abruptly from the plain and as we approached it we could see climbers on the sides. We stopped for a while to watch them. There were quite a few at various places and we could see someone had already made it to the top, some 1600 metres (5250 feet) above sea level. How elated he must have felt! 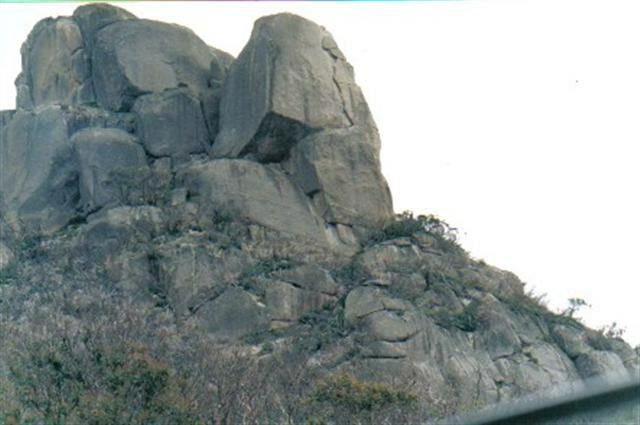 Just below, under the overhanging rock, there were a couple climbers having a rest. We were absolutely fascinated by these climbers; we counted about 12 but there could have been more on the other side. at Lake Catani, the only campground inside the National Park. 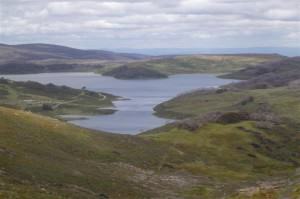 This is a very popular place for campers with swimming, kayaking, and canoeing just some of the activities on offer. The fishing looked good, too. We had intended to go to the Reservoir picnic area for lunch but the gate across the road was closed and locked. At our visit to the information centre later on we enquired about this and were told that recent heavy rain had made the road impassable for now. A pity, because I would have liked to have seen it and I think that John would have enjoyed a little off-road excursion in the mud! On our return to camp Sean decided that he wanted to go swimming in the river. Now, it was somewhat warmer down there than up on the mountain but it wasn’t THAT warm. It wasn’t until we noticed some girls swimming in the river that we put 2 and 2 together! They were roughly the same age as Sean and when they invited him to join them wild horses couldn’t have held him back! So while Sean went swimming we went for a drive up to the weir under Hoppers Bridge at Porepunkah. The sun was glinting off the water as it crashed over the weir and the spray was like a shower of sparkles with a myriad of rainbow colours. It was really quite beautiful. intricate maze of tracks throughout the whole place and someone had, very thoughtfully, erected signs with street names on them. I imagine it would be very easy to get lost in there. We exited the forest just across the road from Porepunkah Airport. I kid you not! Porepunkah Airport. But we both gave a little chuckle when we realised that the road actually crossed the runway; there is a sign stating that aircraft landing and taking off have right of way! You think?! They may not land 747’s here but I, for one, would not care to play chicken with an aeroplane! Returning to camp, Sean had finished his swim and he and John decided to throw a line in. But after two evenings of watching the fish jumping out of the water right in front of us, tonight there wasn’t even so much as a nibble! Can you believe it! At least I didn’t hear the famous “fish dinner tonight” cry! Victoria’s highest peak, and with all the mountains around; it would be picture perfect in the snow. We stopped at the lookout for a photograph and then continued on into town. And after a brief stop at the information centre we set about exploring. 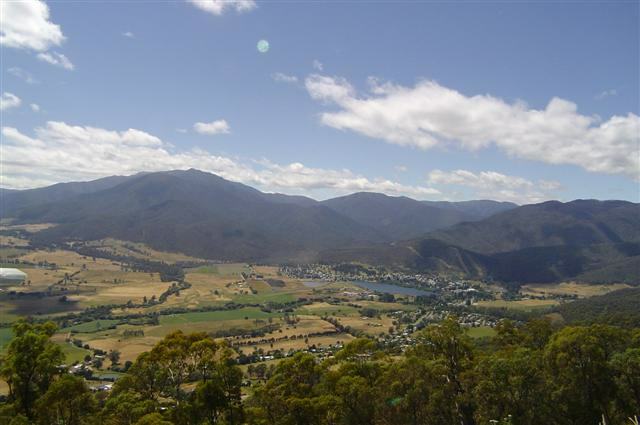 The Kiewa River runs through Mt Beauty and the Kiewa Hydro Scheme was built to meet Victoria’s growing electricity demands. Mt Beauty was built to house the 4000-odd workers involved in the construction from the late 1930’s to 1961. Set in the Bogong High Plains, the area is well suited to hydro electricity. 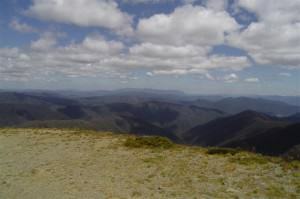 Mt Beauty sits at the base of Victoria’s highest mountain, Mt Bogong (1987 metres – 6519 feet) and not far from Mt Beauty is the Bogong Alpine Village, nestled beside Lake Guy. This village was established in 1940 and its magnificent gardens are surrounded on all sides by a forest rich in native wildlife. 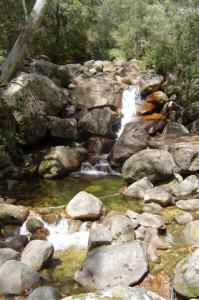 We left Mt Beauty and began our trek up the mountains to the ski resort of Falls Creek. I’d never been to this ski resort before so it was totally new for me. I was really looking forward to it and I wasn’t disappointed. Definitely a year-round destination, Falls Creek is Victoria’s largest alpine resort and covers over 450 hectares (1112 acres). I can’t really imagine how beautiful it all must look covered in snow; I mentioned to John that we’ll just have to come back in the winter! We took the Bogong High Plains Road out to the Rocky Valley Dam and actually drove across the dam wall to the other side. There was a canoe on the water and its occupant was paddling at a leisurely pace. He was certainly either very keen or very brave; the temperature was a chilly 13°C and the wind very strong. Back across the dam we continued up the road as far as the rocky outcrop called The Ruined Castle; at this point we were more than 1700 metres (5577 feet) above sea level and looking down at Rocky Valley Lake. 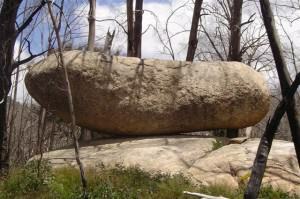 Rocky Valley Lake is the highest significant body of water in Australia however it is not the highest lake. At a slightly higher altitude is the secluded Pretty Valley Lake. We didn’t try to get to that one; the wind was howling at Rocky Valley and I’m sure there was ice in it. It was while we were looking for a sheltered spot to have lunch that we came to a lookout and from there we could look down on Falls Creek village. At this lookout we were overlooking a ski run that is aptly named “Adrenalin”. Only for the very brave, I think. Sheltered spots were virtually non-existent so we made our way back down to the village. But again we had no luck finding anywhere sheltered from this wind and so, reluctantly, we bid farewell to Falls Creek and started to make our way down the mountain. Along the way we found a lay-by in the road that was reasonably sheltered and we stopped there for lunch. Cars driving past tooted their horns and we waved back but no one else stopped. Back in Mt Beauty we wandered around some of the souvenir shops for a short while but before too long it was time to head back to Porepunkah. We had made plans to visit the bistro at the Porepunkah Hotel for dinner that night but the caravan park was hosting a barbecue with a fancy dress contest. The park was supplying all the meat and those attending had to provide their own salad. We had deliberately used up almost all of our supplies knowing that this was our last night here so the bistro won out over the barbecue. Porepunkah Hotel bistro is the place to go if you’re either extremely hungry or just have a huge appetite. To say that the meals were big would be an understatement; John and I could have shared one and still have some left over! The food was very good and we certainly got value for money and it’s obvious that the folks around here, residents and tourists alike, agree; the place was really jumping and there was not one spare table. We returned to camp to find that the fancy dress contest was in full swing. The theme for those dressing up was the letter “F”. There was an abundance of “fairies”, several “freaks”, a “frog” or two, someone in a “fat suit”, but the ones that had us giggling were our neighbours who went wearing plastic raincoats. Yes, they were “flashers”! The music and laughter, cheers and applause was loud and everyone was having a terrific time but it all ended at about 9:30 and folks started drifting back to their various campsites and vans. By 10:00 the park was almost silent and we took ourselves off to bed with the prospect of a busy morning ahead of us. quite strong and bitterly cold but even that didn’t put us off. It was totally awesome; I felt like I was at the top of the world. The road coming in to Mt Hotham village, one of Australia’s highest ski resorts, passes under a bridge or archway that has been decorated in an eye-catching manner. We passed under the bridge and the resort was spread out in front of us, the chair lifts coming almost to the edge of the road. It must be quite unnerving to drive along here when the lifts are operating, especially at dusk. The area was explored in 1854 and today is known as a skier’s paradise. 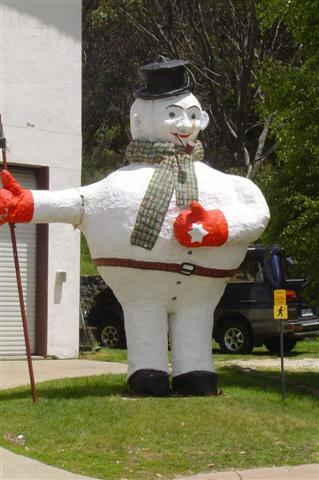 It has more natural snowfalls than any other Victorian mountain. This is also the highest point on the Great Alpine Road and Mount Hotham’s summit rises to an altitude of 1,861 metres (6,106 feet) above sea level. The village stands at a height of 1,750 metres (5,740 feet), making it the second highest resort village in Australia. 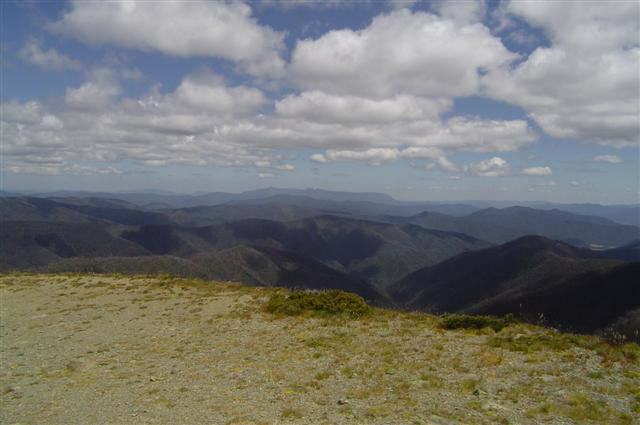 There are several hiking trails here and you can actually hike all the way to Mt Feathertop, some 11 kilometres (7 miles) from Mt Hotham village, depending on how keen or energetic you are! Mt Feathertop is the state’s second-highest mountain at 1922 metres (6305 feet). 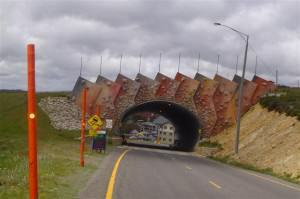 We didn’t plan to stop in Mt Hotham and I was disappointed that time didn’t permit even a short visit but you can bet it’s high on the list for our next trip this way. From its history that dates back to goldrush and bushranger days to its stunning scenery, all year round and in all kinds of weather, Victoria’s High Country, the roof of Australia, is an experience you will never forget.